We’ve all been there, we want to do a funny composite of our friends and we get into Photoshop, and before you know it, you’re there for hours doing pixel by pixel masking to get the perfect cutout. Little straggles of hair keep frustrating you and before you know it, you’re fed up and wasted half your day doing nothing. Like I’ve said, we’ve all been there. Let’s never be there again. Today I’m going to show you how to use a fast, loose and almost sloppy way to get perfect cutouts. And no, using the Magic Wand Tool is not allowed. 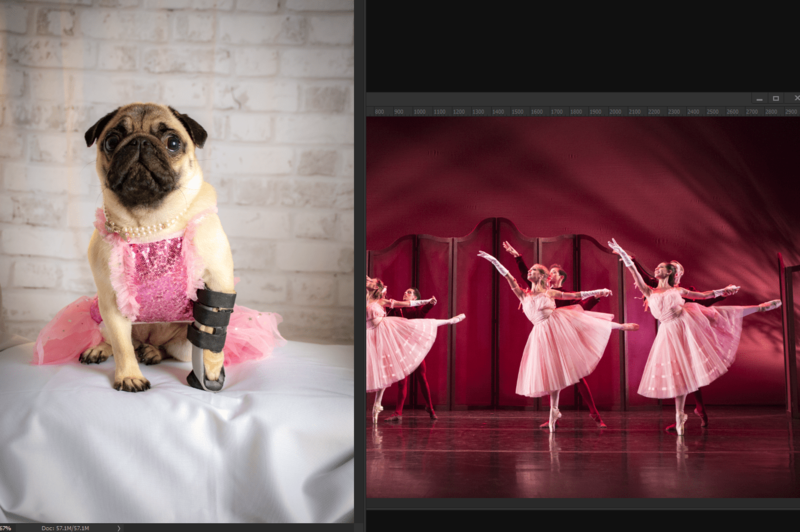 Here is our task, get this pretty pug @philomenathepug into the Ballet! Well let’s get to it! I know I just said “DON’T YOU DARE USE THAT MAGIC WAND” and slapped your hand. But, let’s go up to it. Ok, now before you get all excited on learning how to use the most useless tool on your bar, watch… Click and hold on that stupid magic wand (sorry I really hate that wand). There you go! The Quick Selection Tool! The beginning of your selection salvation is here! Now, before you start going crazy and using it like a paintbrush, slow down, we aren’t here to use this to do the same nonsense people have done using the masking tool. We are using this to get a good feel of what we want to cut out. It’s not exact, but who cares! We’re doing this fast and loose. Now some people would just make a layer mask of this and call it a day, and while that works in some regards, it makes for some chunky edges. While it’s ok, you can see that it really is jaggy around the edges. Don’t give up hope. Why would I make a shortcut a heading? Because it’s that important. It’s so important. You could go to Select > Select And Mask. But you’re going to never want to use anything but the shortcut because of how much it will be used for all your future projects. What does this do when you have those marching ants on from before? A masking selection? That’s old news… or is it? Yeah, you’re right, I guess I wrote all this out for no reason. Wait, what is this on the side? Oh, it’s the promised land, a way to be lazy AND to be professional all at once! This properties box will be your savior for doing masks and cutouts, because it will give you the edges that you need. You can literally play around with it all. Let’s take a look at Philomena’s head and see the difference a few tweaks of a slider make. If you don’t know where this is, maybe I need to start with a “What the hell is Photoshop I’m Scared Hold Me” series of posts and videos. More importantly, let’s see how this Pug looks at the Ballet now. On the left, we have our new special cutout that looks professional and has tiny hairs that stick out. On the right, we have our sad garbage pug who looks like we had construction paper and safety scissors to cut her out. So what do we have left? Minor adjustments to get the little things to match up, lighting, shadows, reflections. There you go, now you can slack off twice as hard by cutting down the time it takes to make these great edits in no time at all instead of taking all day to work on one!